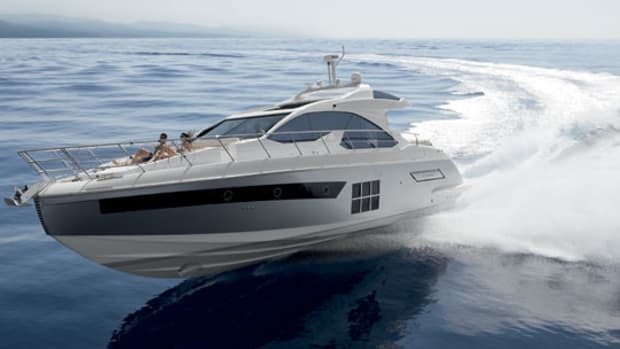 Azimut takes a look at the past and steps into the future. When a production boatbuilder sends its latest prototype on a 2,000-mile shakedown cruise right after the boat’s first show, you know it must be serious. Especially since the show was in October and the shakedown lasted into the Mediterranean winter. 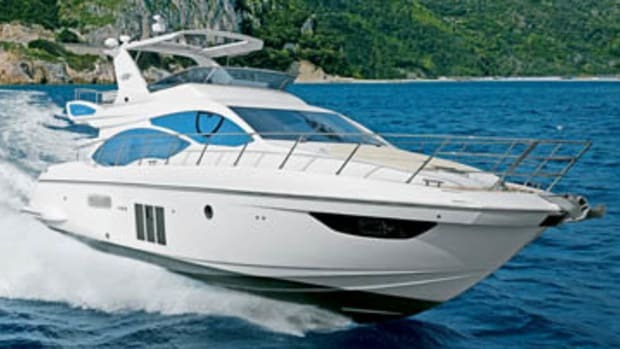 Azimut is indeed deadly serious about the Magellano 74, which it intends to be accepted as a serious cruising boat. 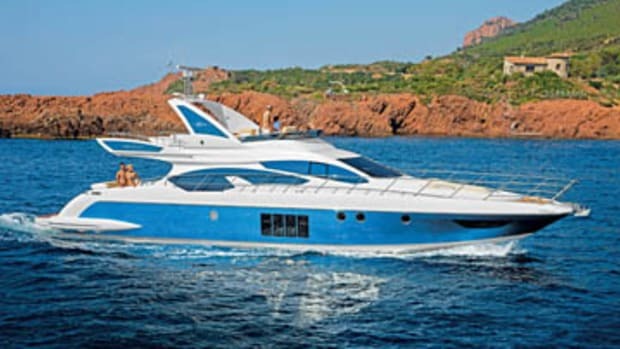 The prototype’s voyage around the western Med began at the Azimut-Benetti shipyard in Viareggio and took in Varazze and Cannes—encountering ten- to 12-foot seas and 30-knot winds en route—before striking southwards to Palma, Mallorca, and then Sid bou Said in Tunisia. Another rough night passage saw the yacht call in at Malta, then Porto di Roma and finally back home, to Italy’s northwest coast. Zipping round the headland for lunch and a swim before hurrying home again is all very well—and often all we’ve got time for—but now a shipyard famous for its ultra-cool flying-bridge and S-class express models says the market is ready for a return to traditional cruising values: boats designed to go places, with seakindly hulls and long-range capabilities. But if you think that means heavy displacement, deep draft, and lots and lots of teak, think again. For its new cruising yacht, Azimut went to a designer who does not appear to have the word “traditional” in his lexicon. UK-based Ken Freivokh has many high-profile projects under his belt, most famously the giant, square-rigged superyacht Maltese Falcon. For the naval architecture, Freivokh called in Bill Dixon, who is also a fixture of the European scene, accomplished in power and sail, and with a track record in production cruisers and custom superyachts. 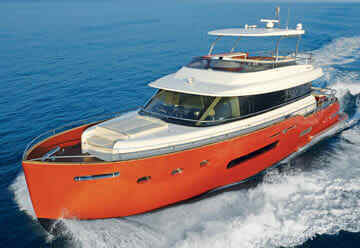 His highly stylized, yet rugged, profile certainly advertises the Magellano concept as a new kind of motoryacht. Dixon’s work below the waterline is equally distinctive: full-bodied, round bilge sections along the centerline, complete with a traditional long skeg to protect the running gear, flanked by broad planing surfaces down the sides. On this size of yacht, it’s an unusual hull form, pioneered and developed by Dixon in his successful 44- and 50-foot SeaRanger designs—although he acknowledges a debt to Terry Compton, the British naval architect best known for his work for Albin and who came up with the original idea in the 1970’s. The other long-distance reality, of course, is a practical, comfortable interior. 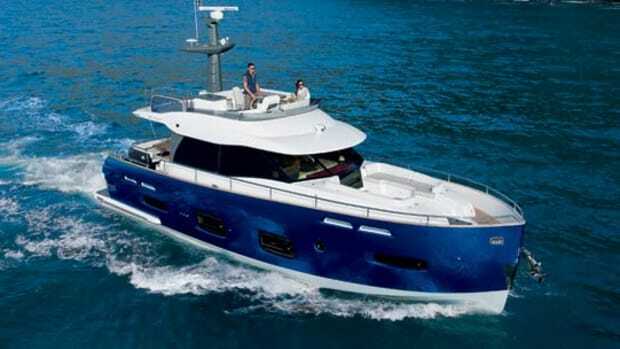 The fit-out of this first Magellano was criticized by the shakedown crew for its lack of handholds and numerous sharp edges—and it’s true that the galley fiddles, the window surrounds down below, and even the corner of the dressing table in the master cabin, are all remarkably unforgiving—but Azimut has taken these criticisms on the chin, promising to do better on future boats. The main-deck design, though, is a master’s class in how a cruising yacht interior should be done. 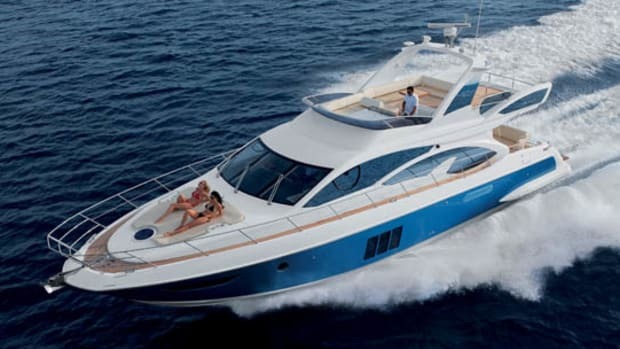 With a single-level floor, it has a virtually uninterrupted 360-degree panorama of windows, so that everyone, including the helmsman, can see all ‘round when underway, wherever they are sitting. The open, sociable galley, aft on the port side, has no tall ‘fridges or freezers to block the view. Even the flying-bridge companionway, to starboard, has glass sides. Below decks, Azimut has also yielded to Freivokh’s deceptive minimalism. Resisting the temptation to cram in more berths than necessary, the prototype Magellano features a three-cabin layout, ensuring that everyone has enough space to make any extended cruise more a pleasure than a trial. There is a full-beam owner’s suite amidships, well illuminated by those narrow hull windows, and a smaller but well-proportioned VIP suite in the bow. 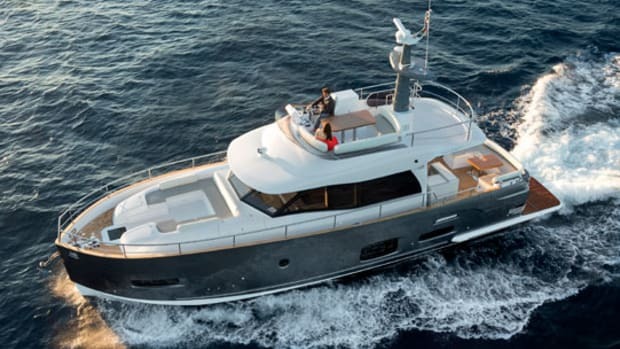 The twin-berth cabin on the starboard side is no ballroom, but it’s still a usable cabin with the same 6&apos;5"-plus headroom as the rest and a generous semi-en suite/day head that is a mirror image of the VIP’s. The crew quarters are in the stern, one small cabin to port and a utility room to starboard that on future boats will probably become a second crew cabin. The engine room is reached via the crew’s lobby and is a small and well-packed compartment with the gensets outboard of the big Cats—but service access is not too bad. There is plenty of stowage space down below, not just in the crew area and in conventional drawers and hanging lockers, but also under the berths—most notably the two big, 6&apos;6"x5&apos;7" doubles in the master and VIP suites, whose mattresses hinge upwards on strong gas struts to swallow any number of bulky items. 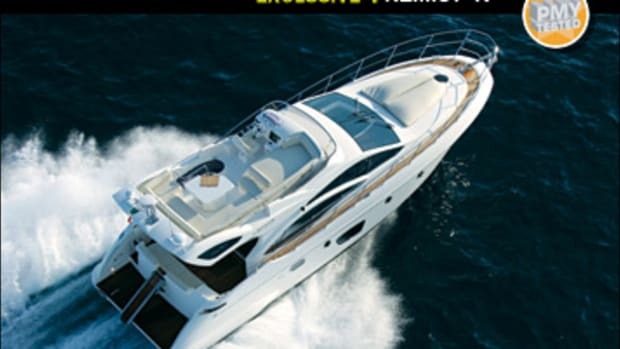 The flying bridge also belongs to a boat intended to spend lots of time at sea, with a large, solid hardtop that shelters all the seating, including the helm. It’s supported by an enormously robust-looking stainless steel frame (albeit with at least one small weld crack on my test boat), while other sturdy deck fittings, from the teak table on the flying bridge to the useful, secure handrail running around the superstructure, also have an air of geological permanence. This attention to the yacht’s physical presence is quite deliberate. When you venture far offshore, you demand reassurance from your vessel, and this visual evidence of heavy, solid construction certainly checks the right boxes. But the yacht also feels solid. In harbor, the hull’s long skeg and comparatively deep, rounded bottom help the Magellano to sit compliantly in the water, awaiting your bidding, without being blown off its heading by the breeze or rocked unduly by passing wakes. At sea this sense of unflappable reassurance is strengthened by the way the hull moves. There’s little trim change as you push the throttles home, and although acceleration is surprisingly brisk, the hull tracks straight and true with no effort from the helm, carving its wake with some of that inexorable momentum you’d find in an old-fashioned, heavy-displacement boat—although the Magellano is somewhat faster. She also turns obediently, with little heel. I clocked a maximum speed of just over 23 knots (26.5 mph), though Dixon is probably right to contend that most owners will opt to cruise at between 15 knots (17.3 mph) and 18 knots (20.7 mph). At those speeds, the Magellano feels supremely comfortable, eating up the miles at an easy stride, while the low sound levels (see “By the Numbers,” this story) on the main deck will ensure that her passengers remain as comfortable and relaxed as the yacht. We had no waves to speak of on test day though by lying beam-on across our own wake it was possible to judge that the hull’s combination of round bilges, broad chines, and a comparatively low center of gravity make it pretty stable even without the optional Seakeeper gyrostabilizers. That plumb bow cuts the waves with great style, and the spray rails fitted to the bow after the shakedown seem to keep decks and windscreen dry. The Magellano was designed as a long-range passagemaker, and I predict she will excel in the role. But that success has more to do with her huge, 6.4-ton fuel capacity than with any special fuel efficiency. Where Dixon’s hull excels is in its speed range, as comfortable at eight knots as it is at 23 and really does offer the twin capabilities of both a displacement and a planing hull. 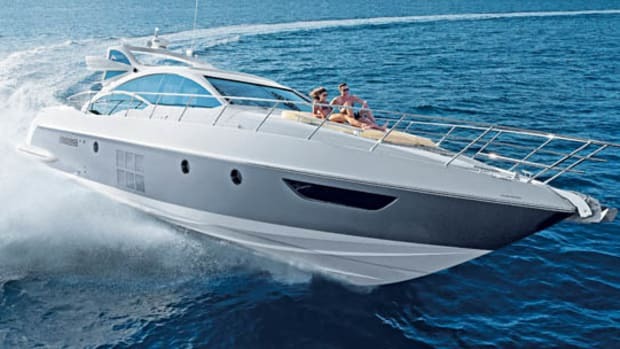 The Magellano is a remarkable piece of naval architecture, and coupled with Freivokh’s excellent, bright, and comfortable interior, she’s as unique and special as Azimut hoped. 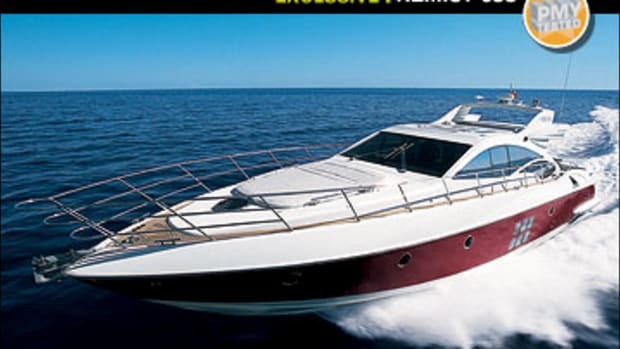 This is indeed a new kind of cruising boat—undeniably modern and inimitably Italian—for those who like the old style of cruising.